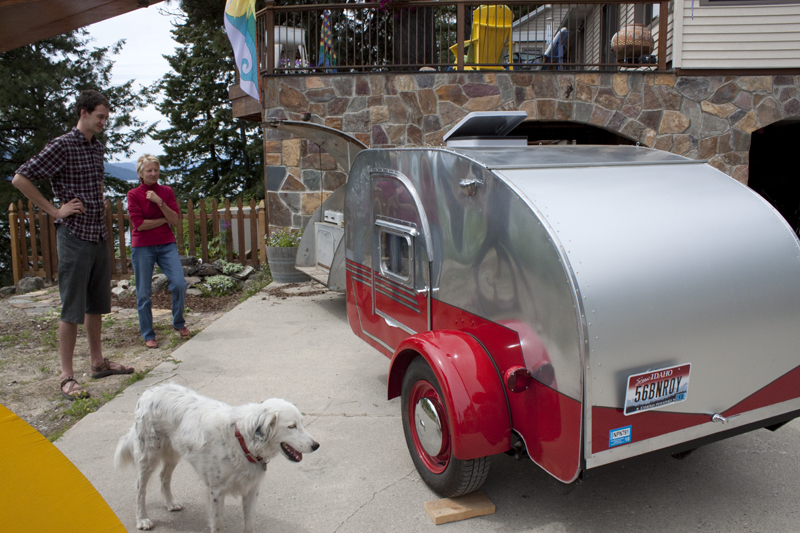 If you have seen the “Historic Camping & Teardrop Trailers” educational film, you are familiar with the story of Debra Kellerman. Her story of purchasing three vintage trailers and restoring them with little previous knowledge of tools is one of my greatest inspirations (which is why her story made the film). Sandpoint Magazine in Sandpoint, Idaho just published an article which features Debra’s story. Debra told me a few months ago that something was in the works with the magazine but I had forgotten about it until a copy arrived in the mail. This marks the second magazine publication of a featured story in the “Historic Camping & Teardrop Trailer” Film (read Larry Shank’s Published Story Here). It is pretty awesome to have such famous friends! I’m stoked for them both. If you’re like me, you absorb all vintage camping news like a sponge that always thirsts. Check out page 11 of the 2012 Summer edition of Sandpoint Magazine and absorb Debra’s story! I recognized the picture. 🙂 Nice article, glad to see the shout-out to your film. I’m loving that paint job!